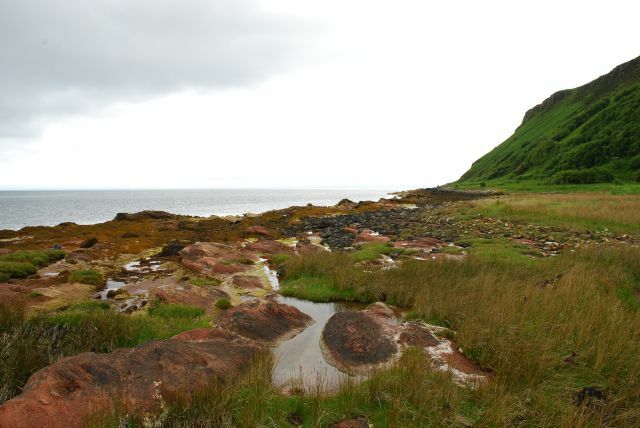 On Arran you sense time, the accumulation of thousands and millions of years, more intensely than anywhere else I’ve been: the deep geological time of rock formation along with signs of thousands of years of human presence in the landscape. This was a place to which we had to return. This time we found a party of primary school children studying the stones and writing poems inspired by the place. We distracted them for a while with our spaniel, which disappeared in a scrum of adoring girls. After they had left, an intense silence descended, leaving the moor as it was and will be. Millenia deep. You are standing in a sacred landscape, where a complex story of belief and ritual has unfolded over thousands of years. This moorland is rich with signs of human life, belief and death. People lived and worked here for many thousands of years. Hidden in the peat are the remains of their homes, marks made by their ploughs, and the outlines of their fields. The land in this valley was fertile and attractive, and the people who lived here were farmers. Their ancestors had hunted and fished, but from about 4000 BC people began to clear the land for farming. 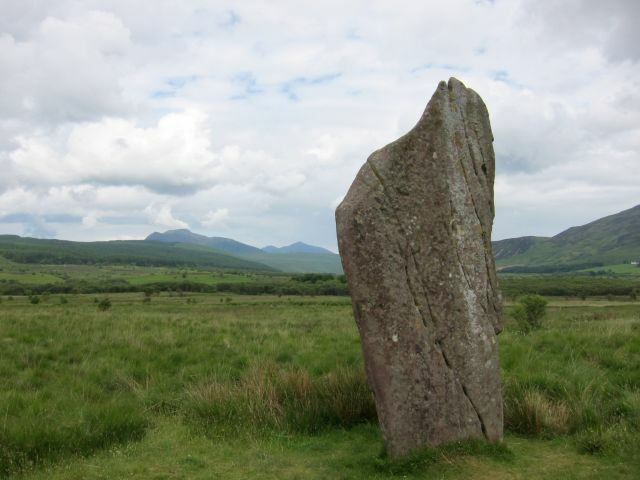 These enigmatic stone circles have long fascinated visitors and locals alike. In the 19th century they were investigated by probing through the peat with metal rods and eventually the peat was removed. However, most of our knowledge of them comes from scientific excavations carried out in the 1980s. From about 2000 BC families lived here in round houses built of wood or stone. They grew barley and wheat, and kept animals like sheep, pigs, goats and cattle. Meat, vegetables, bread and cheese were produced and they made their own tools and clothes from the resources around them. Around 4,500 years ago (at about the same time as monuments like Stonehenge were being built elsewhere in Britain) people erected elaborate timber circles . The timber later decayed and the land was cultivated, but the sites remained important. 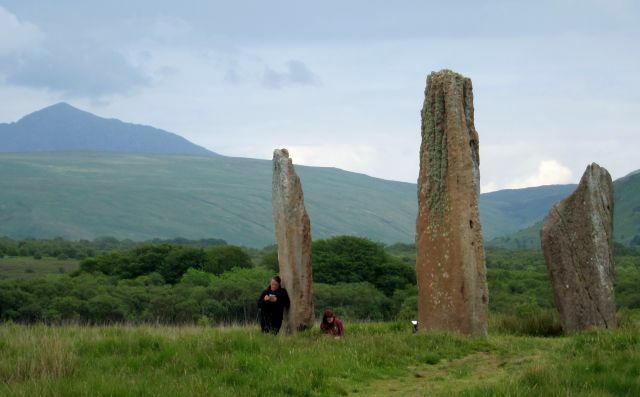 Five hundred years later two stone circles were erected on the same sites as the earlier wooden ones. Probably at the same time four other circles were erected, one with a double ring of stones. The result was an impressive and significant ceremonial centre for those who lived or travelled here. There may be other remains still hidden in the peat. Although experts can’t agree about how the circles were used, the rising sun may give a clue. This particular location offers an early view of the midsummer sunrise at the head of Machrie Glen. 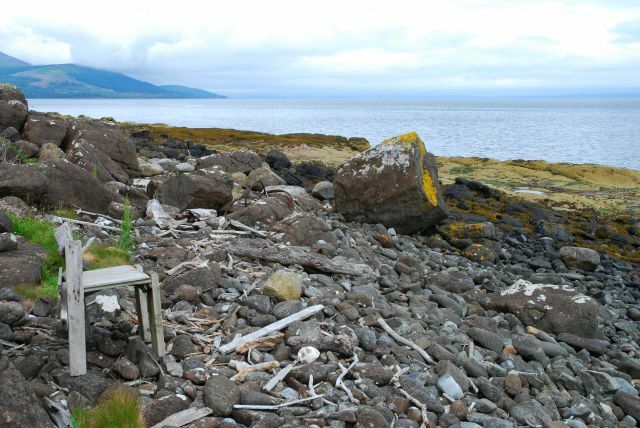 It’s possible that important ceremonies took place here at the midsummer solstice. When excavated between 1978 and 1986, the ground was shown to be criss-crossed with marks made by ards – early ploughs which cut through, rather than turned over, the earth. Earlier in the day we had visited the Arran Heritage Museum at Brodick where we saw this display of ards excavated on the island. These differ from stone ard shares found elsewhere – being heavier and shorter. 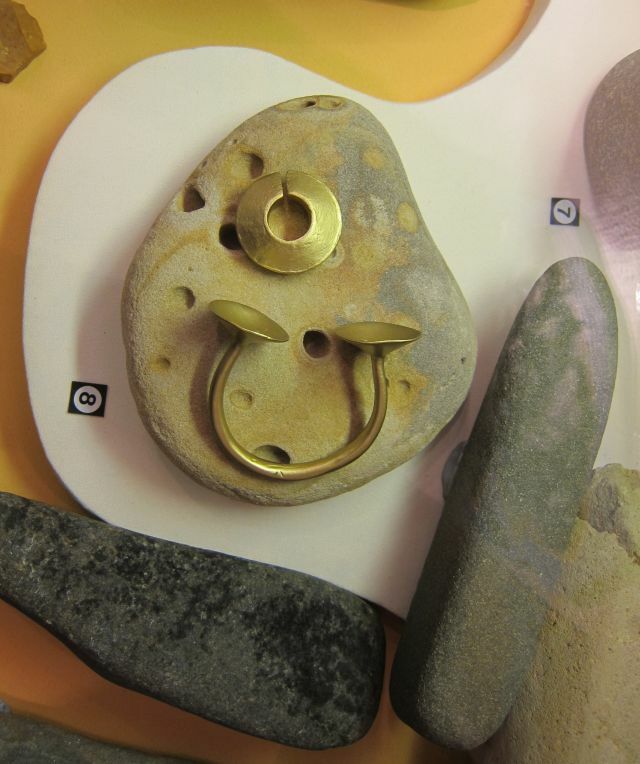 Also on display in the Museum were these two replica gold ornaments: a pennular ring of solid gold – probably a cloak or dress fastener, and a gold ‘lockring’ for holding back a lock of hair. The originals were found at Whitefarland (on the northwest coast of Arran) and both are now in the Kelvingrove Museum, Glasgow. 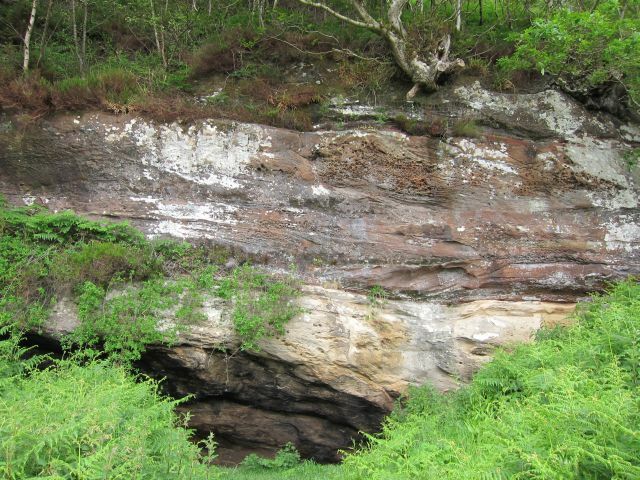 The larger, wealthier and more hierarchical communities of the Bronze initially used copper, extracted from small surface deposits in Mid-Argyll. Soon, tin ores from Cornwall were being imported and alloyed with copper to make bronze which was much harder and made more effective weapons. Considerable organisation was required to produce these objects, and they always retained a high status position. 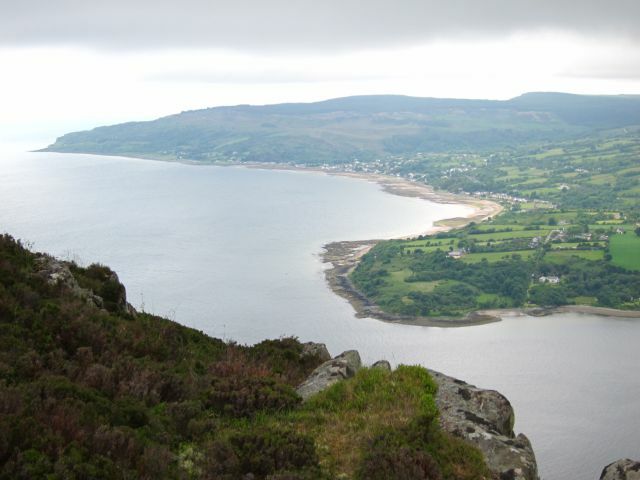 On another day we walked the coastal way from Clauchland Point at the north end of Lamlash Bay as far as Corriegills Point, before turning inland and returning to our starting point along quiet lanes and through patches of old wildwood. 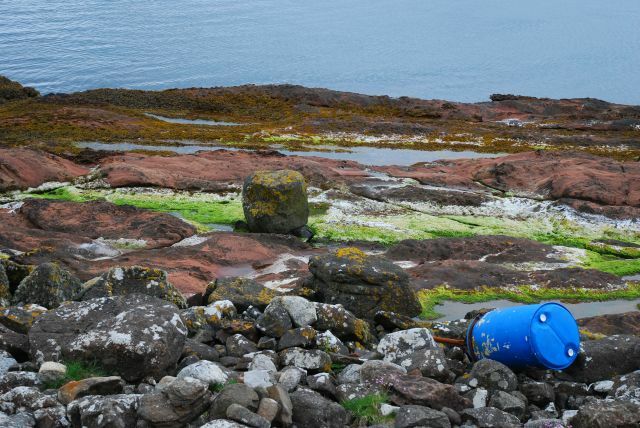 At the start of the walk along the shore was a board explaining that a large section of Lamlash Bay is now a No Take Zone – a designated area of sea and seabed from which no marine life can be removed. 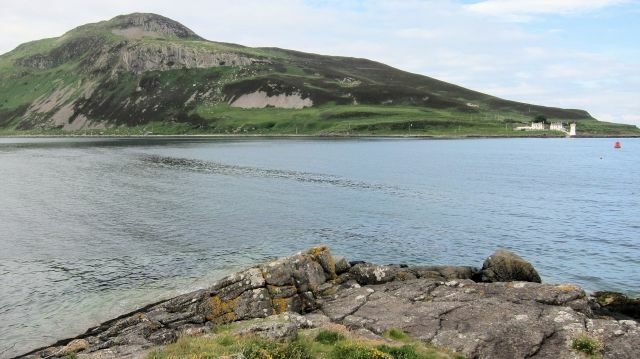 Decades ago, Arran was renowned for its fishing, when cod, haddock, hake, dab, plaice and turbot were plentiful in the waters of the Firth of Clyde. 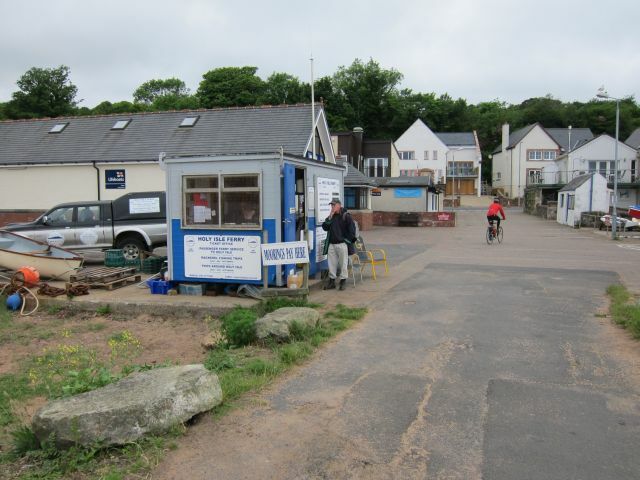 Today the white fish have gone, leaving only prawns and a dwindling stock of scallops. 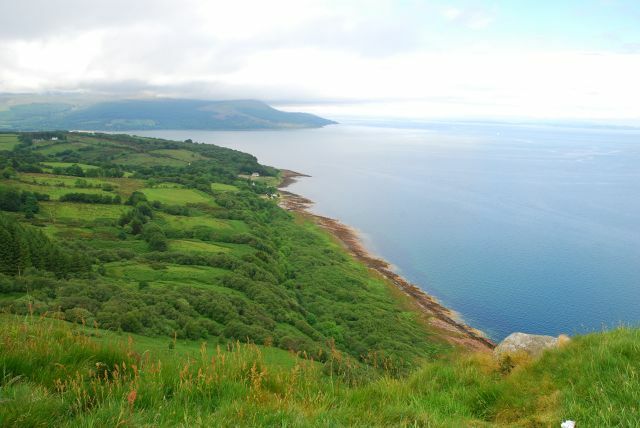 Concerned about the damage caused by trawling, campaigners formed the Community of Arran Seabed Trust and spent 15 years lobbying for a No Take Zone. Iain Stewart explained its significance in his series for BBC TV Scotland, Making Scotland’s Landscape. If the establishment of the No Take Zone is a positive development, the walk along the Clauchland shore provoked less optimistic thoughts. All along the shore was strewn with plastic debris of all shapes and sizes – a large drum, a big fish storage tray, and many, many plastic bottles that once contained water or fizzy drinks. The shoreline is strewn with boulders that have become overgrown with turf at the high tide line. I began to notice, however, that every few yards, the turf underfoot would sink and squeak where the grass had overgrown a plastic bottle. Take a walk along any beach anywhere in the world and washed ashore will be many polythene plastic bags, bottles and containers, plastic drums, expanded polystyrene packing, polyurethane foam pieces, pieces of polypropylene fishing net and discarded lengths of rope. 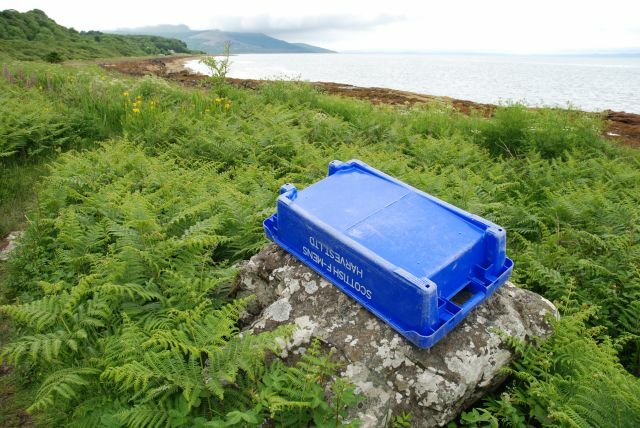 Together with traffic cones, disposable lighters, vehicle tyres and toothbrushes, these items have been casually thrown away on land and at sea and have been carried ashore by wind and tide. 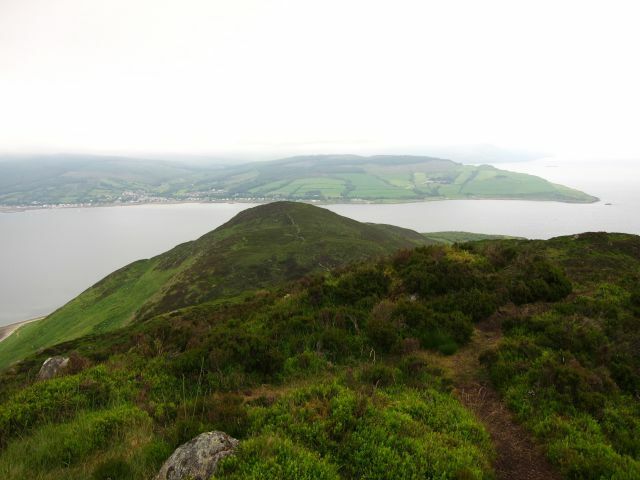 The walk finally brought us to the Iron Age hill fort at Dunn Fion, superbly situated on the very edge of a high cliff facing the sea, with commanding views of Brodick Bay in one direction and Lamlash Bay in the other. The fort is small, but in this advantageous position it probably served as a secure home for an extended family at a time when intertribal conflict and attack were a constant threat. Archaeologists have determined that on the flat summit was a small oval fort little bigger than a hut circle, surrounded with a sizeable five foot thick earth and stone wall. On the southerly slopes, where access was easiest, a defensive ditch was dug enclosing cultivated natural terraces. An interpretive board explains that the site would have been fortified with ramparts using local natural materials, typically slabs and blocks of stone, rubble, boulders, earth and turf. This fort would have presented an impressive profile on the sheer northerly cliff at a time when appearance and status were of great significance – this show of strength a further defence against cattle rustlers and tribal conflict. 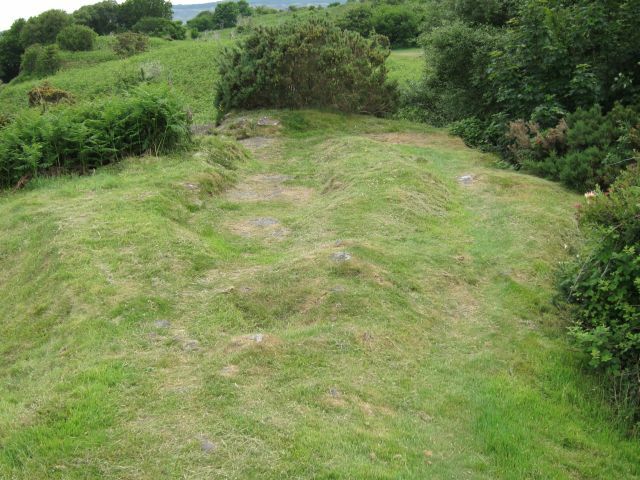 From evidence collected at similar forts on the island it seems likely the occupants of Dun Fionn would have kept cattle, sheep, goats, horses and pigs, and grown cereal crops such as barley. The circular hut dwelling would have been made with timber and thatch, typically bracken and heather. Inside, along with the sleeping area, a fire and a loom, a circular quern would have been used to grind grain. A triangulation point now installed at the summit detracts somewhat from the atmosphere of the place. 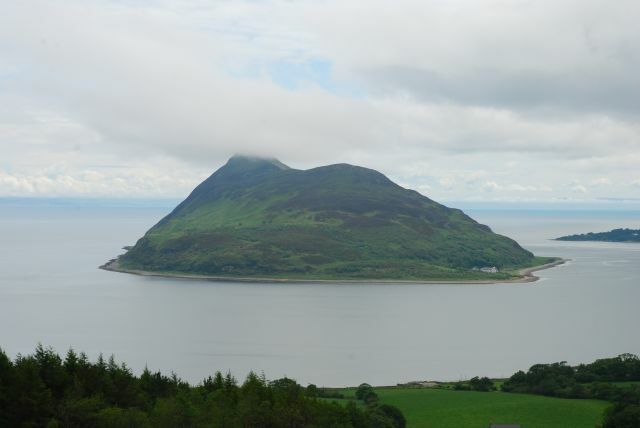 Across the water lies Holy Isle, which I was to explore the following day. A little further on, there is a Second World War pillbox, or look-out shelter, one of those erected in 1940 during the scare about a threatened invasion. 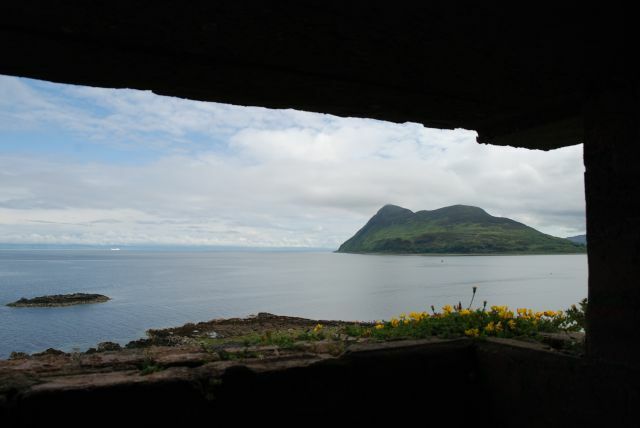 Standing in the pillbox, I gazed out across Lamlash Bay at the distinctive shape of Holy Isle, with its twin peaks – Mullach Beag and the higher Mullach Mor. The island has an important religious past, dating from the 6th century when Celtic Saint Molaise lived there as a hermit. 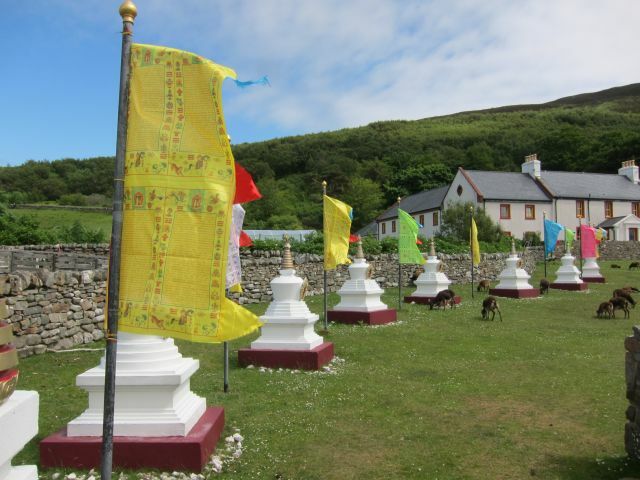 Since 1992, the island has been owned by a Tibetan Buddhist organisation that has established a Centre for World Peace and Health that offers a variety of courses, retreats and environmental programmes. It is not a Buddhist community, but is run by the Rokpa Trust that also manages the Samye Ling Monastery and Tibetan Centre in Eskdale which we visited last year. 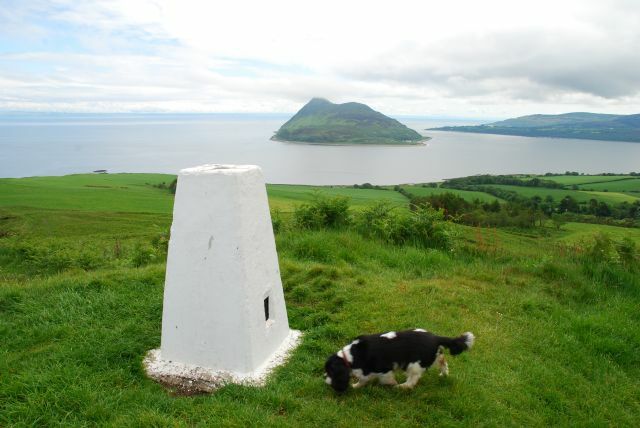 There is a clearly marked circular walk that leads over the two peaks before descending to the western shore (the whole east side of the island is a Nature Reserve and off limits). I set off up the path from the jetty, past Buddhist prayer flags and stupas and up through an area of woodland with young birch trees. 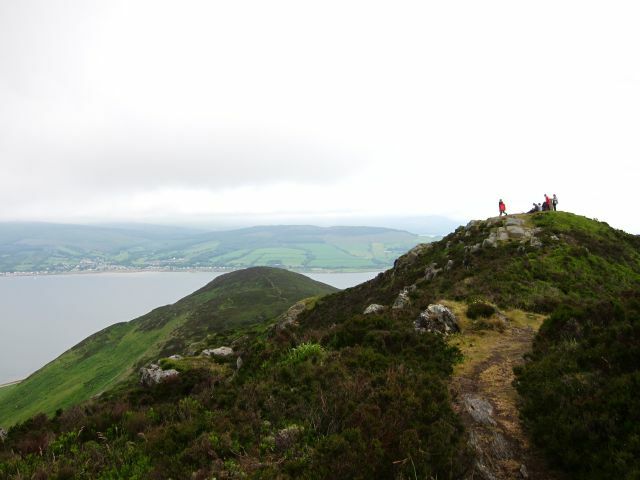 There’s a steady climb to the top of Mullach Beag, 759 feet above sea level, with expansive views across Lamlash Bay. From here it was possible to appreciate the commanding position occupied by the Iron Age fort at Dun Fionn just across the water. I had been the only person coming across on the 10 o’clock ferry and I felt a sense of profound solitude as I stood at the first peak. 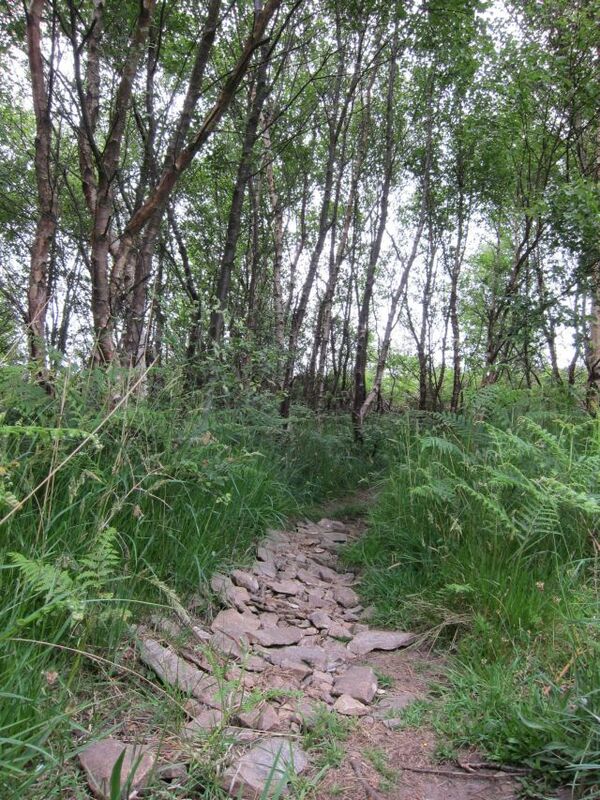 The path then descended a little, before climbing again to the windswept crest of Mullach Mor, 1026 feet above sea level. Here, at the highest point, unexpectedly, I encountered a small party of teenagers sprawled around the trig point at the peak. 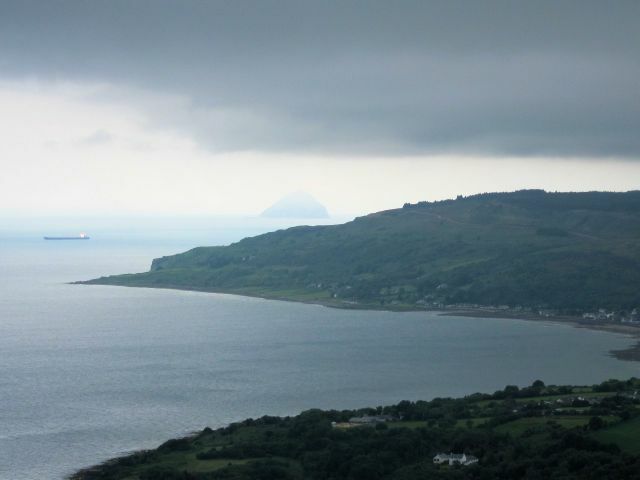 The views from the peak were stupendous: to the southwest was the broad sweep of Whiting Bay with Ailsa Craig looming out of the haze beyond Dippin Head. To the north, Goat Fell was shrouded in low cloud. I moved on, and soon the solitude enfolded me once again, and I was accompanied only by the cry of the gulls and the distant murmuration of the waves far below. The climb down from Mullach Mor is fairly steep and at one point the path leads past hidden crevasses that have been marked by blue ropes. On the descent, two lighthouses are in view. On the eastern shore stands the outer lighthouse, or Pillar Rock, built in 1905 and the first lighthouse built with a square tower. It had a fog horn and a revolving light that was lit by paraffin. 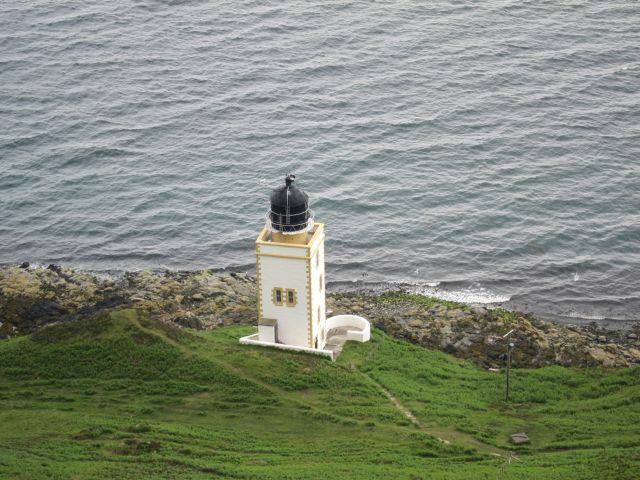 In 1877 the inner lighthouse (facing Arran) was designed by Thomas Stevenson, father of the writer Robert Louis Stevenson. The path finally returns to sea level, and the last couple of miles is a level walk along the grassy raised beach. The inner lighthouse cottages now accommodate the Inner Light Retreat for women, and the retreat and adjacent gardens are closed to the public. On the hillside are several newly built semicircular retreat pods and an accommodation unit for the retreat master. Here individuals can follow a traditional Buddhist retreat of three years and three months. 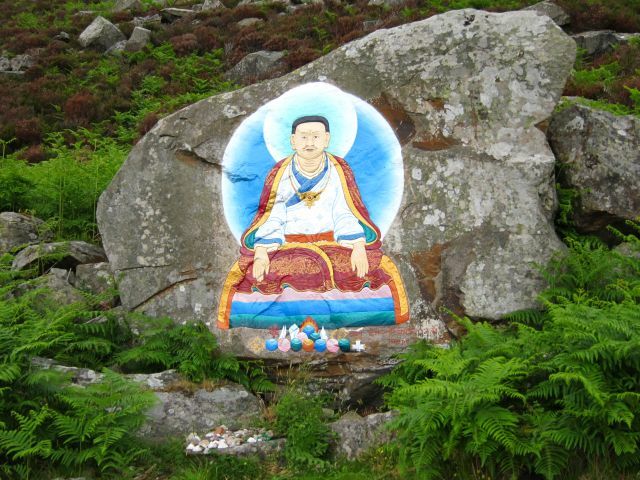 In Tibet it is traditional to carve and paint depictions of the Buddha and saints on rocks and cliffs along pilgrimage routes and at holy places, to remind and inspire everyone who passes of the spiritual vision towards which to strive. 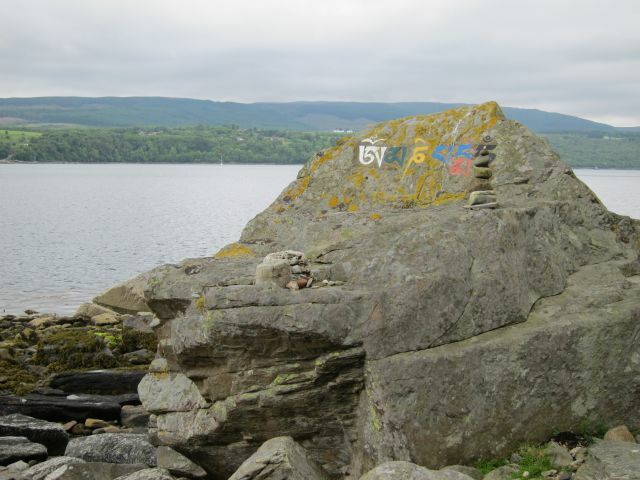 A Tibetan monk living in Samye Ling has carved several figures on the rocks along the path to the south end of the island, depicting key historical figures of the Kagyu Lineage and other significant images. They are carved and painted according to the traditional proportions and colours of Tibetan art. Tibetan Buddhism recognises many different tantric deities, each of which represents a different qualities of enlightened awareness. Tara is often seen and described as a Mother, because her compassion is so great that every being is as precious to her as a child to its mother. She is also described as Mother of all the Buddhas, because she is seen as the embodiment of perfected Wisdom. In the form of White Tara, she can help preserve and protect one’s precious human life and cultivate wisdom. 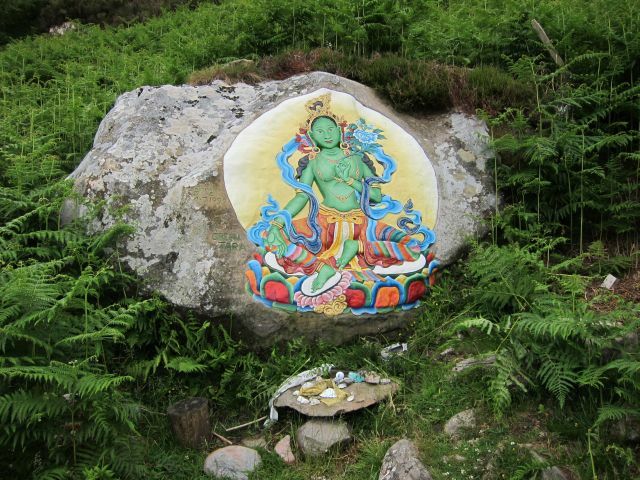 As Green Tara, she helps to overcome fear and to remove both external and internal obstacles on the path. She is quick and fearless in her activity – her outstretched right leg shows her readiness to spring into action whenever she is needed. Not long before I went to Spain, I read an essay in the journal Artesian by a Czech writer called Vaclav Cilek, cryptically entitled Bees of the Invisible. Cilek – himself a long-distance wanderer – proposed a series of what he called ‘pilgrim rules’, of which the two most memorable were the Rule of Resonance (A smaller place with which we resonate is more important than a place of great pilgrimage) and the Rule of Correspondence (A place within a landscape corresponds to a place within the heart.) ‘The number of quiet pilgrims is rising,’ he observed. ‘Places are starting to move. 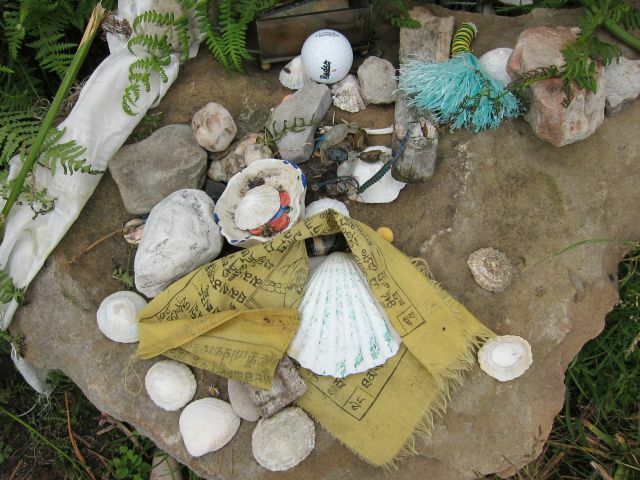 On stones and in forests one comes across small offerings – a posy made from wheat, a feather in a bunch of heather, a circle from snail shells’. 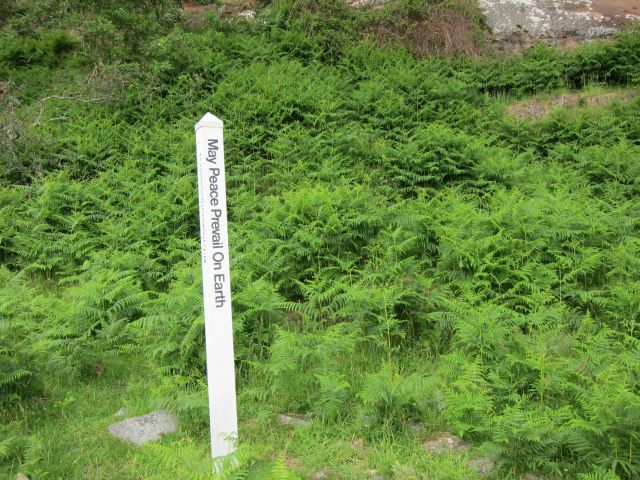 I had come across such DIY land-art often myself: the signs of unnumbered “quiet pilgrimages”, of uncounted people improvising odd journeys in the hope that their voyages out might become voyages in. Just after the last of the Buddhist images, at the foot of the red sandstone cliff, is St. Molaise’s Cave. Molaise was born in Ireland, the son of an Irish king of what is now called Ulster. Rejecting his princely upbringing, at the age of 20, he chose to live a secluded life as a hermit in this cave. He was later ordained in Rome, before returning to Ireland. 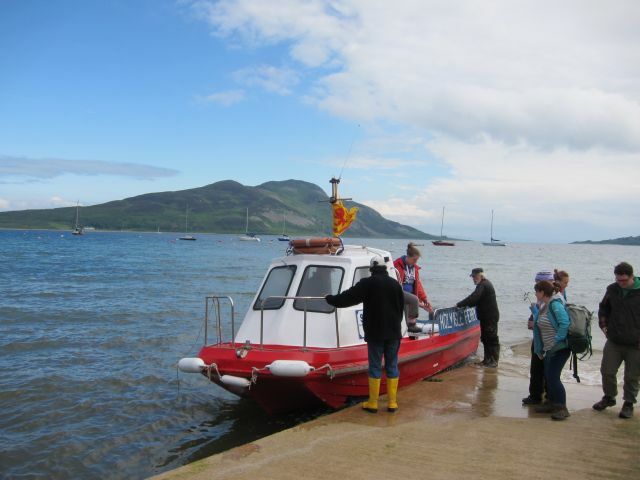 Centuries later, in 1263, the Vikings arrived in Lamlash Bay. 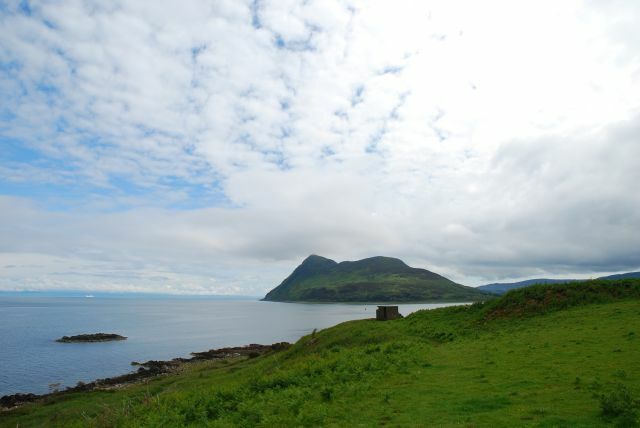 King Haakon of Norway brought a fleet of ships to the shelter of the bay, before fighting the Scots at the Battle of Largs. 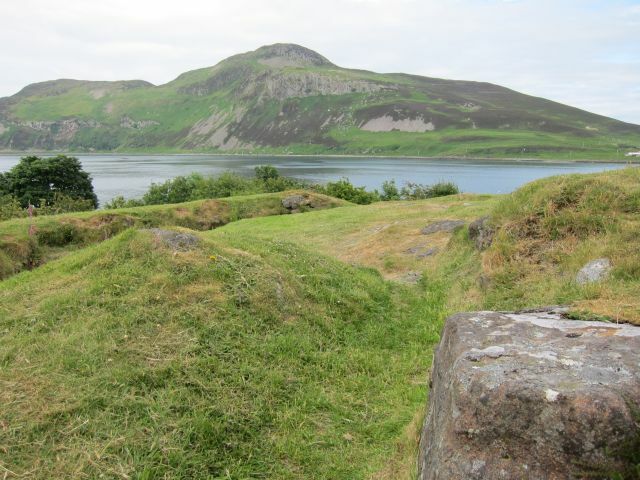 Vigleikr, one of his marshals, came ashore at Holy Isle and cut runes with his name on the wall of St. Molaise’s cave. 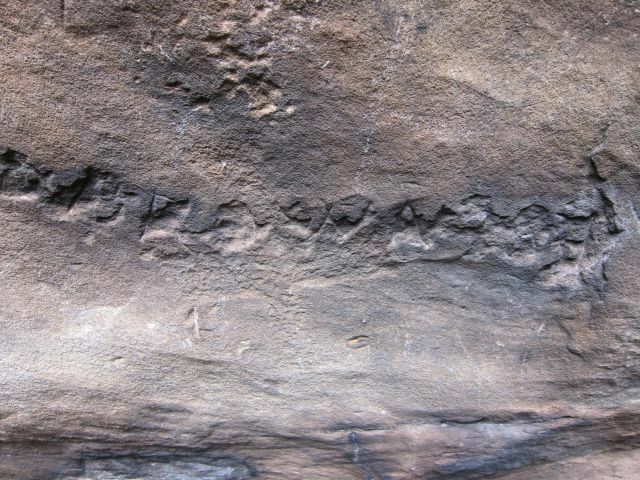 Several carvings can just be distinguished on the wall – simple crosses, perhaps made by pilgrims, and carved personal names. I don’t know whether the symbols carved into the rock face in my photo (above) are actually Vigleikr’s runes – I just made a guess. From the cave, it is only a mile of flat walking back to the jetty and the Centre, where meditation courses take place. As I walked along, just after midday, I began to meet individuals walking out from the direction of the Centre. I smiled and greeted the first two or three with a cheery ‘hello’, but received only a glimmer of a smile in response. Then I realised – they were probably on a silent meditation programme. So I limited my further acknowledgements to a smile. I recite, along the path to the eastern shelter. And people enslave themselves to miracles and fables. I look for the simplest way to sow and reap my nature. On the field in front of the Centre a flock of the ancient breed of Soay sheep was grazing. 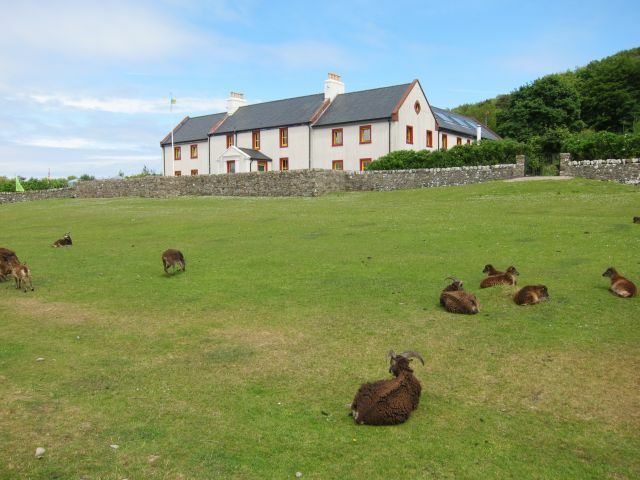 They are found only here and in the Outer Hebrides on two of the three main islands of St Kilda: Hirta and Soay, which is Norse for ‘sheep’, giving the breed its name. No one knows how or when the sheep arrived on St Kilda, though archaeological evidence suggests that they have been there since the Bronze Age. Soay sheep are thought to be one of two ancestors for all domesticated sheep, and are very hardy animals, not dependent on people for anything. There are two other kinds of animals on the island which I did not see on my walk. Eriskay ponies are the last surviving remnants of the original native ponies from the Hebridean Isle of Eriskay (south of South Uist), and have ancient Celtic and Norse origins. The ponies are a hardy breed with their dense and waterproof coat, enabling them to live comfortably in the Scottish climate all year round. There are also white Saanen goats with impressive horns, possibly brought here originally by the Vikings. The poet Kay Hathway has written a poem inspired by seeing a woman on Holy Island practising T’ai Chi, the ancient martial art now widely followed to bring about a state of mental calm and clarity. It draws on the concept of the Taiji (the ‘supreme ultimate’) found in both Taoist and Confucian philosophy, representing the fusion of Yin and Yang. each blade bends in continuous cadence. animation, a rhythmic form of self. to fuel the belly and to feed the soul. 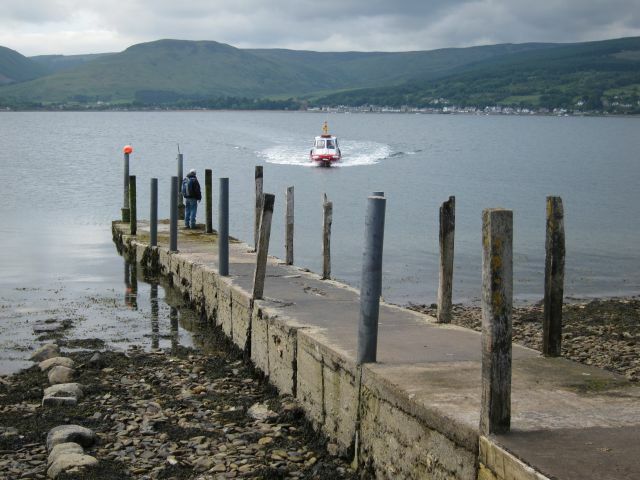 I waited at the jetty for the ferry that would take me back across the water to Lamlash. Goat Fell and the ridge of peaks above the town were now clear of cloud: after a chilly start, the day had turned out warm and sunny. I was not alone on the crossing: the teenagers I’d met at the summit were returning on the same ferry. Reunited with partner and dog, that afternoon we walked out to Kings Cross Point, the headland at the northern end of Whiting Bay just across the water from St. Molaise’s Cave with its Viking runes. 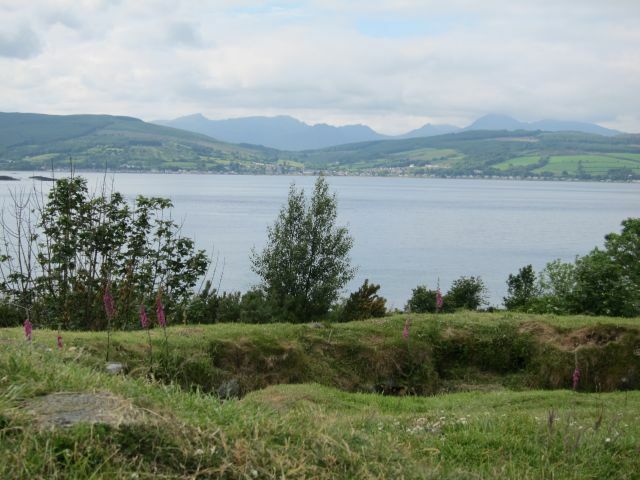 Our aim was to explore the substantial Viking grave that is located on the headland. 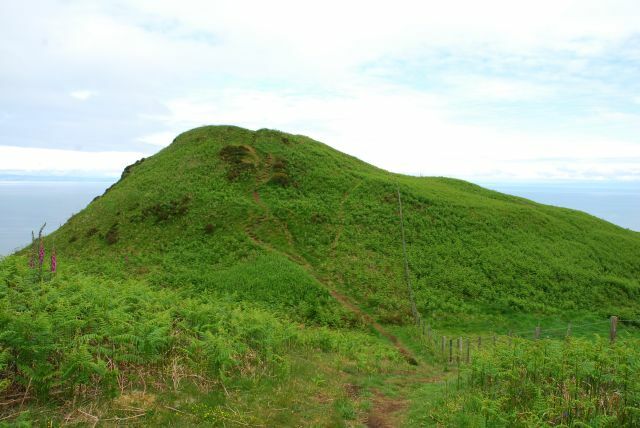 Although the site has been damaged in the past, this burial mound is of a type rare in Britain. 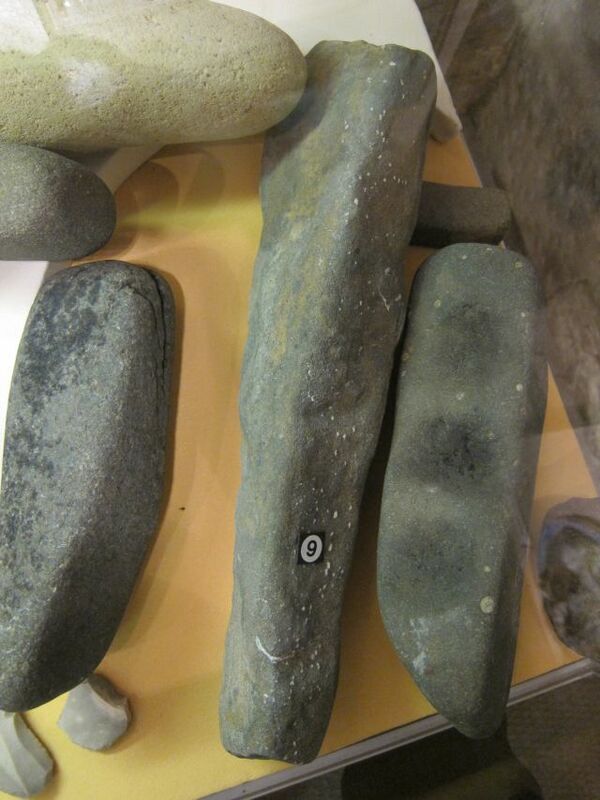 It represents a cremation burial in a boat of one of the early Vikings who landed here in 1263. When the site was excavated it was found to contain fragments of burnt bone and charcoal, whalebone, iron rivets and nails as from a boat, and a bronze coin minted in York in 850. It’s possible to just make out the boat-shaped outline of the burial mound (below). The sign back at the road that points to this site reads ‘Viking Fort’ – a confusion that has arisen, no doubt, because right next to the Viling burial is a small Iron Age fort. From here, the people who lived within the fort’s enclosure could look across the bay and see the fort at Dunn Fion, described earlier. An ancient Irish poem called ‘Agalllamh na Senorach’, first recorded in the 13th century, perhaps captures the island and its attractions as it would have been experienced by those people. Blue spears are reddened among her boulders. Beautiful essay Gerry, almost a book! It does sound like a truly spiritual pilgrimage. I am reading ‘The Old Ways’ and have just read one of the Scottish chapters so it is good to see some images as he leaves it very much for one to imagine from the words, although they are very evocative. His pilgrimage article was excellent too. The only pessimistic note is the rubbish – such a global problem now and the sea is difficult to regulate over. “An important biological species – humankind – is at risk of disappearing due to the rapid and progressive elimination of its natural habitat. We are becoming aware of this problem when it is almost too late to prevent it. It must be said that consumer societies are chiefly responsible for this appalling environmental destruction. With only 20% of the world’s population they consume two-thirds of all metals and three-fourths of the energy produced worldwide. They have poisoned the seas and the rivers. They have polluted the air. They have weakened and perforated the ozone layer. They have saturated the atmosphere with gases, altering climatic conditions with the catastrophic effects we are already beginning to suffer. 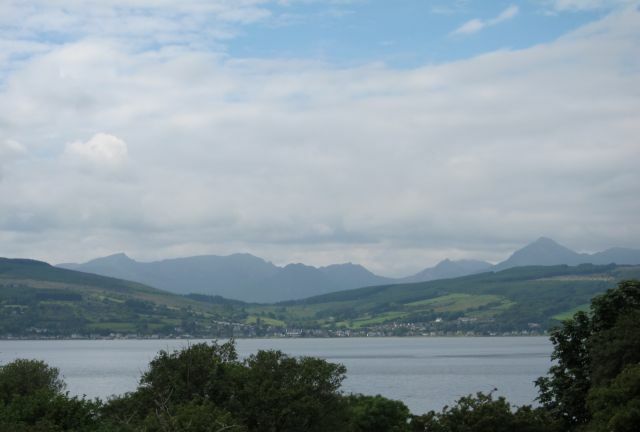 Hi, have just found your blog as we are visiting Arran for the first time, and today did the circular walk from Lochranza via pass, Laggan cottage and Fairy Dell, thank you for the interesting information. We will catch up with more historical sites in the week. However if you want to experience a land where millennia have left a very present and haunting presence, do visit the Orkneys, especially mainland and Rousay. The sites have become rather more popular in the last 30 years but if you visit off peak dates or times you will have an unforgettable experience. Unless you already have and I have missed it on website! Thanks, Ruth. Pleased you found the post worthwhile. Orkney has been on the must-go list for a while, but so far not gone. Soon, I hope.